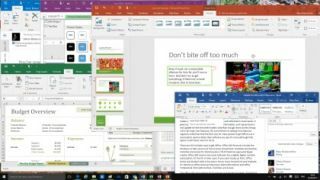 The full desktop version of Microsoft Office will soon be available in the Windows Store, with Microsoft planning to introduce it in June. We’d already heard a number of rumours to this effect, and at Microsoft’s big launch event this week – where Windows 10 S and the Surface Laptop were revealed – Terry Myerson, Executive VP of the Windows and Devices Group, announced that full-fat Office was about to arrive in the Windows Store. No target date was made clear at the time, though, but as VentureBeat revealed, Microsoft later confirmed that the launch should come in June. That’s not cast-iron, mind you, but given that it’s next month, we can surely expect the suite to land very soon even if it slips. Note that Office apps are already available in the Windows Store, but these are cut-down and touch-focused apps as opposed to the fully fledged versions of Word, Excel and PowerPoint. Of course, with the launch of Windows 10 S, Microsoft really has to make sure that the full Office apps are available in the Windows Store – because the new lightweight version of Windows is locked down to software downloaded from the store for security reasons. (You’ll be able to use the Office apps offline, by the way – an important point for the Chromebook-rivalling laptops running Windows 10 S). Test versions of the Win32 desktop Office apps were available over a year ago, so it’s taken some time to get this far. As we noted back then, the idea is also to make installation as simple as possible, allowing users to set up the suite with a minimum of fuss. Which is never a bad thing. In other recent Office news, we saw that Microsoft is slowly herding Office 2016 users towards becoming Office 365 subscribers, by cutting off access to the business flavours of OneDrive and Skype by the end of the decade for the former group. Will Windows 10 S notebooks dominate our best laptops for students?